The morning starts with a run on the beach. We run, stop and do stick work, run again, more stick work. And repeat. We do this for about two hours before we take a little meditation on the beach. We’re not back in the room before 9:15, shower, clean Katja’s wound, and are down at breakfast at 9:30. That gives fifteen minutes for breakfast before we have to drive to the clinic. At the clinic we find that the wound is closed. Supposedly a good thing I thought, but noooo. It has to be opened again. That’s another round of painful injections, though it was a little lighter this time. As the thing is not inflamed anymore the pressure inside is less straining. The reason for it to be opened is that it now can grow from the bottom and out, instead of potentially create some sort of kong. To make sure it doesn’t happen again a special bandage is put inside. Right. Inside. It has to be changed ever so often. 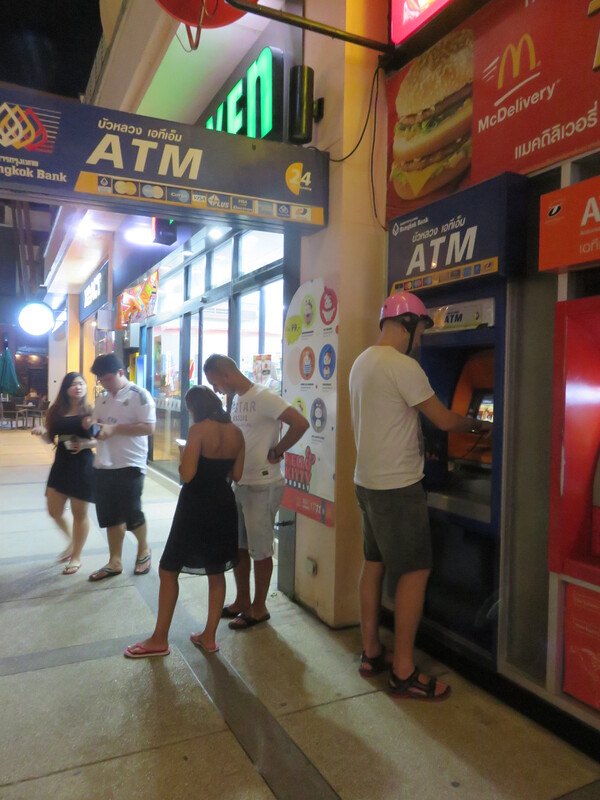 OK, right out of there, jump on the motorbike, drive to hotel and get to Muay Thai. Did I ever tell you that Katja’s a tough chic? We’re divided into teams and each team had their own little bus. I had told my team leader not to wait for me if I’m not they’re in time. I’m thirty seconds late. They didn’t wait. Lucky for me the black team was last out of the parking lot and I squeezed in with them. We did two hours of Muay Thai with focus on the basic stuff. Very good training, indeed. Then we did something really cool. One of the trainers, Joe, is a strength coach. He took us through exercises with a rubber band that blew my mind. We all got a band each, and I think Katja and I will do lots with this after the camp. It was educational as well as fun and tiring at the same time. Coming back to the hotel to shower and change, (both clothes and dressing on Katja’s wound) then lunch. Then rent own motorbike, and run out to get more water. We burn through a lot of liters daily. We get twenty minutes in the room to relax before going to next class. This one focuses on Personal Leadership. It was a good class where we set focus on where we are in life. We also got the last t-shirts we have ordered and thereby completed our order. Very nice indeed. 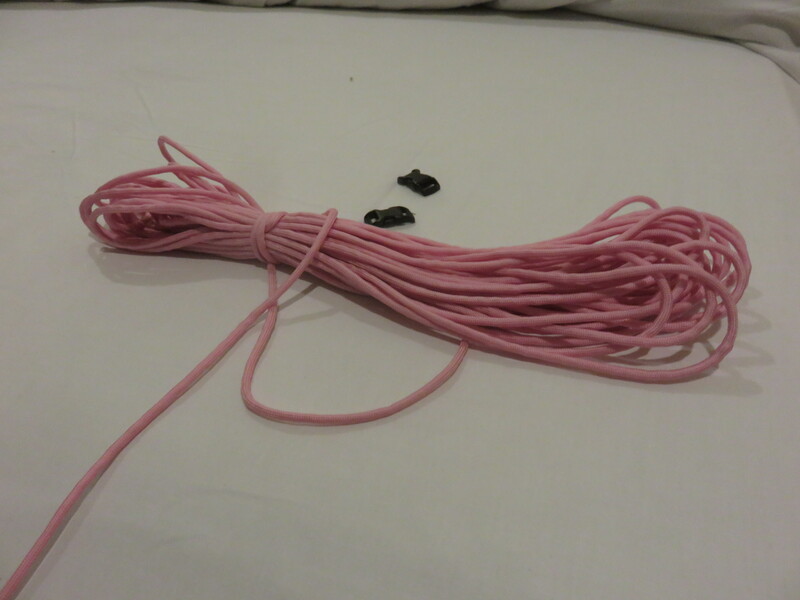 As a huge surprise Heikki showed up with several meters of pink paracord and some bracelet locks for Katja. He’d read on the blog that we looked for it and had some laying around. How nice isn’t that? Thank you very much, Heikki! Now Heikki did knife fighting. All who reads this blog don’t necessarily see the art aspect of that, so I will not dwell in detail. Suffice to say it was a good class. We ended the days training with a stick fighting class with Johan. A very good class that played on the footwork from this morning’s training on the beach. We expanded and expanded and did sparring games at the end. Nine hours of training is done and now we go back to the clinic with Katja. We have to wait a little before it’s her turn and I get to check out my rashes. Katja goes through a tough turn when they replace the bandage inside the wound, but she got promises it will hurt less tomorrow. Another good news is that we only have to go once a day, and can have the breakfast in relative peace and quiet. We get Indian food on our way home and are about to post yesterday’s blog post online. The internet don’t work, so that has to be postponed. It’s now almost bedtime, for tomorrow brings another nine hour’s of training. The mantra of the camp is stronger-harder-better. Gung ho, all in, grit ftw! Your dreams are in the other side of your grit.